Three Toi Iho artists are showing their work in the Oceania exhibition in the Royal Academy, London this year. They are Lisa Reihana, Michael Parekowhai and Fiona Partington. This is the first major Oceanic show to be held in the UK. Oceania shows from 29 September to 10 December 2018. Soft Paradise / Ka Rongo Te Pō, Ka Rongo Te Ao: Works by Fiona Pardington at the Tauranga Art gallery. This recently opened, solo exhibition features a selection of Fiona Pardington’s signature large format photographic works that explore themes of nature, collecting and remnants of history. The exhibition features 16 of her impressive works focused predominantly on still-life arrangements, alongside a pair of large-scale portraits. Fiona Pardington is an award winning, internationally renowned artist who has been honoured in New Zealand and France. 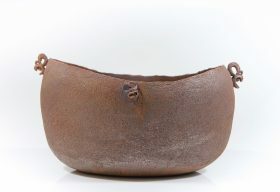 She is represented in the collections of The Museum of New Zealand Te Papa Tongarewa and the Christchurch Art Gallery, amongst many other public collections in New Zealand. Fiona is also showing work in the Oceania exhibition at the Royal Academy of Arts, London 29 September – 10 December 2018. After two years working in Dubai, Hiwirori Maynard (Rongowhakaata) is glad to be home. He was contracted to perform as part a four-person cultural group named Te Mana at the JW Marriott Hotel. He was well-trained for this having performed with Waihirere at Matatini (or the Aotearoa Maori Performing Arts Competition as it was then) alongside teaching in Gisborne. The Marriott has been home for Hiwirori a number of times over the years with different stints there in 2008, 2009-10, 2011-12 and most recently 2015-17 when he finished as Band Leader of Te Mana. Hiwirori originally trained in the late 1990s at Toihoukura with Sandy Adsett, Derek Lardelli, and Steven Gibbs finishing with a Maunga Kura Toi Bachelor of Maori Art in 2004. 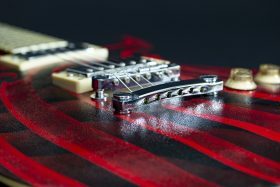 Since then he has been working mostly as a kapa haka and art tutor in a range of schools including Te Aute College (2012-15) alongside maintaining a constant art practice, exhibiting across the country and working on commission, including Hakirirangi for Te Papa Tongarewa (2017) and MOKO Guitars (an example is below) for Hukarere Maori Girls College. Those of us at Toi Iho look forward to seeing his new work. 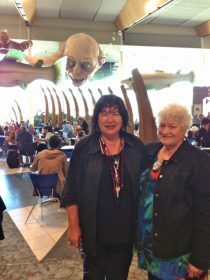 Sonia Snowden and Maakarita Paku at Puanga Kai Rau, Otaki. Venue: Māoriland Hub Date: Rātū 10-17 o Hongonui Disciplines: Tuhi, whakairo, raranga, tāmoko, pūoro, toi kupu, toi matarau, pāhoa, whakarākai, waiata, reo, kiriata, pakiwaitara Kaupapa: Te Kāhui a Mataariki – ngā tuku o te whare tapere, a cluster of Māori artisans, artivists, advocates, educators, practitioners, whānau hapū iwi residing within the A.R.T. confederation in collaboration with Māoriland, Toi Tangata International Gallery and Te Ihiroa Designs. Artists: Sonia Snowden, Elaine Bevan, Diane Prince, Lorna Tawhiti, Taryn Te Uira Beri, Jerome Kavanagh, Maakarita Paku, Karangawai Marsh, Navajo Hibbs, Paranihia Solomon, Kaia Hawkins, Johnny Hauraki, Te Aomarama Wilson, Debra Bustin, Pip Devonshire, Hayley Galo, Jamie Berry, Pikihuia Haenga & Leala Faleseuga, Iriaka & Romaine EpihaFerris, Awatea Crawford, Renee MacDonald, Leah Warbrick, Te Kahureremoa Taumata, Pania Barrett, Tihirua Putaka, Aria Parker, Sophia Parun, Students of TKKM o Te Rito. A group of enthusiastic supporters met in Ponsonby on Wednesday 23 May 2018 to talk about next steps for Toi Iho. Thanks to Trustee Moana Maniapoto for facilitating the hui. Left to right back row: Paula Morris, English and Drama Associate Professor The University of Auckland; Nigel Borell, Maori Curator Auckland Art Gallery Toi o Tamaki; Vicky Thomas, ex Kura Gallery, now at the War Memorial Museum Shop; Elizabeth Ellis, Chair Toi Iho Charitable Trust; . 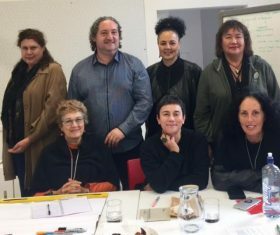 Front row: Mere Harrison Lodge, Elam Alumni, Member of Haerewa Auckland Art Gallery Toi o Tamaki; Lisa Reihana, Artist, Member Toi Iho Chartitable Trust; Moana Maniapoto, Toi Iho Charitable Trustee. Picture taken by Peter Baltus. Reuben Paterson is a dynamic young artist known for his creations in glitter and diamond dust. Along with exhibitions at public institutions throughout New Zealand, highlights of his international career include inclusion in shows at the Musee du quai Branly, Paris, France (2011), Cambridge University of Anthropology and Archaeology Cambridge, England (2007), and the International Biennale of Contemporary Art, National Gallery, Prague (2007). Paterson has undertaken a major commission for the 6th Asia Pacific Triennial at the Gallery of Modern Art, Brisbane (2009) and for the Auckland Art Gallery’s education centre (2012). He is the recipient of several awards and residencies including the Goyang Art Studio residency: Asia New Zealand Foundation’s 2014 artist-in-residence exchange (2014), the International Studio Curatorial Program, New York City (2006) and the Moet et Chandon Fellowship, Avize, France (1997). Gow Langsford Gallery has represented Reuben Paterson since 2003. Artist Sandy Adsett (right) following the conferral of an Honorary Doctorate in Fine Arts with Professor of Maori Visual Arts Bob Jahnke. 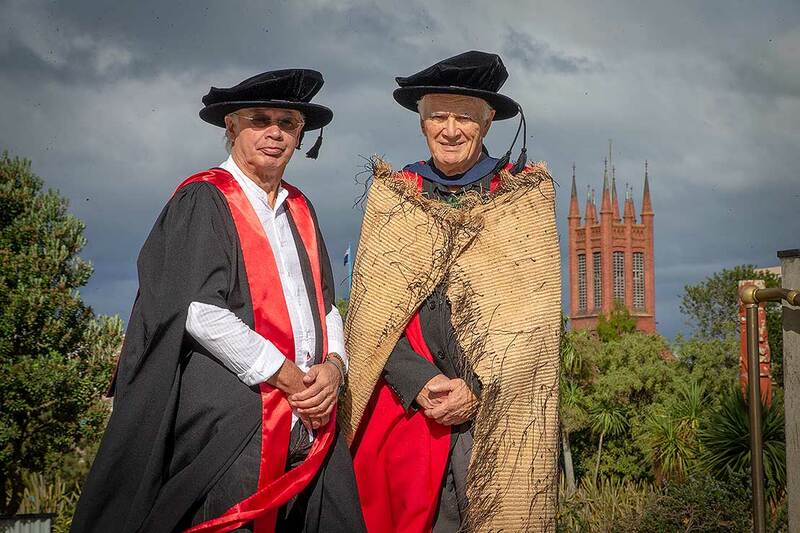 More than 50 years of service to Māori visual art was acknowledged when artist Sandy Adsett was conferred with an honorary doctorate at graduation ceremonies in Palmerston North today. 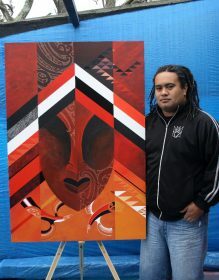 Mr Adsett, Ngati Pahauwera, graduated with a Master of Māori Visual Arts (MVMA) from Massey University in 2006. Trained as an arts specialist for the Department of Education’s Advisory service, he was involved in the implementing of a new Māori Arts focus being introduced into the 1961 schools art syllabus. In 1993 he was appointed principal tutor at Tairawhiti Polytechnic in Gisborne, developing a wananga approach for a more contemporary style of Maori arts programme for Toihoukura School of Maori Visual Arts. He returned to his Ngati Kahungunu roots in 2002, setting up the Toimairangi School of Māori Visual Culture within Te Wananga o Aotearoa in Hastings. Throughout, and fuelled by Māori renaissance of the 1980s that was happening on marae, within the community and in art galleries, his own creative practice remained firmly focussed on attending and retaining the art images of his culture. Described as a true exponent of merging the traditional with contemporary overlays, he is particularly influenced by the design of kowhaiwhai – rafter patterns, with his intricate layers of flat acrylic on board immediately recognisable to arts enthusiasts. Mr Adsett was made a Member of the New Zealand Order of Merit for his services to art in 2005 – the year before his own MMVA graduation from Massey University. “The requirements of the MMVA in having to engage in historical research, two solo exhibitions and documentations were the challengers that attracted me to the course. Things that I might never have otherwise done,” he says. 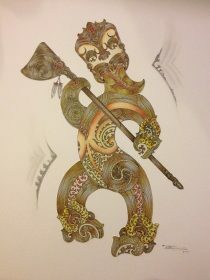 He completed the course under the tutelage of Professor of Maori Visual Arts Bob Jahnke. A close friend of Mr Adsett’s from his boarding school days at Te Aute College, is former Massey University Deputy Vice-Chancellor Professor Emeritus Sir Mason Durie. Mr Adsett sees the honorary doctorate in Fine Arts as recognition to the many who has supported him in his work and studies. 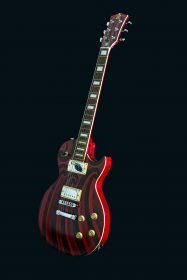 While he respects all forms of artistic discipline, nearing age 80 there is one he remains passionate about. “Definitely painting. I like being confronted with the challenges that Maori compositions, design and colour still gives me”. Currently teaching an art degree in Māori visual art at Te Wananaga o Aotearoa, he will be considering a time when he will hang up his own paint brush. “However, I’m enjoying teaching. So, while the energy is still there, and students continue to respond positively, we will see. Click here to watch a live stream of each graduation ceremony. Artist Chris Bailey with one of five sculptures along Beach Rd in downtown Auckland. Artist Chris Bailey’s artwork, Tauranga Waka – the resting place of canoes, has been installed on Beach Rd in downtown Auckland, along the city’s original shoreline. The set of five bronze sculptures, positioned alongside the cycleway between Britomart Place and Tangihua St, were installed in late March 2018. Each waka emerges from the footpath as though pulled up on the beach edge. Bailey says, “The waka prows depicted are not those of waka taua (war canoes), but rather those of the humble working waka used in fishing, collecting kai moana and moving produce. The contemporary foreshore is now 200m away, since major land reclamation was carried out in the 1860s-1880s. The earth used for this reclamation came from the excavation of the headland, Tangihanga Pūkaea (Point Britomart) on which sat the pā, Te Reuroa, which was immediately above the Beach Road site. “As a society, I like to hope that we have a higher consciousness now around the protection of significant landforms and cultural footprints in the landscape,” says Bailey. “The positioning of these waka pushing up through the pavement reminds us both of the original foreshore lying under the pavement and of the rich Māori maritime history of the area. 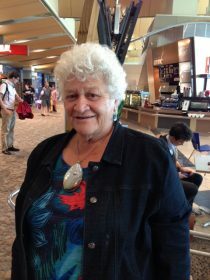 Bailey was awarded the commission in 2016 after a detailed selection process with local iwi and Auckland Council that saw other artists invited to submit as well. The artwork was funded via the City Centre Targeted Rate. This exhibition celebrates the life and work of senior Māori clay artist Wi Taepa as it looks back at over 30 years of his art practice. 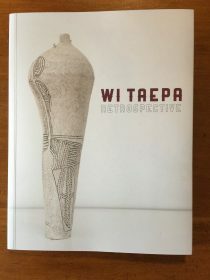 It presents key works from Taepa’s career, sharing the breadth and diversity of his thinking and making. Taepa’s remarkable pieces speak strongly to the development of contemporary Māori claywork and illustrate the freedom, artistic expression and innovation for which he has become renowned. The exhibition is proudly developed in partnership with Pataka Art + Museum. Auckland Art Gallery, Toi o Tamaki, Curator Māori, Art Nigel Borell has also produced a beautiful catalogue with Reuben Friend, Director of the Pataka Art + Mueum. We are all so proud of you. You were awarded Te Tohu Aroha Mo Te Arikinui Dame Te Atairangikahu, the supreme award from Te Waka Toi in 2017, made an Officer of the New Zealand Order of Merit ONZM in 2018 and you are now an Icon of the New Zealand Arts Foundation 2018.